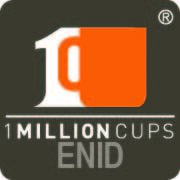 All Day 1 Million Cups Enid This event is free and open to the public. Entrepreneurs, innovators, funders and other interested community members are invited to attend the event scheduled for the fourth Wednesday of each month from 8:30 to 9:30 a.m. at Five80 Coffeehouse, located at 122 E. Randolph Avenue in Enid, Okla. The program’s model is consistent in each city: At each event, two early-stage startups present their companies to an audience of mentors, advisers and other entrepreneurs. Each founder presents for six minutes followed by a 20-minute question-and-answer session with the audience.